The ultra-cool 24-year-old brunette-turned-blond driver appears fazed by absolutely nothing in the fast-paced world that is NASCAR racing. But don't be too quick to judge him -- what you see can be deceiving. In order to prepare for his official NASCAR Winston Cup Series debut in the May 30 Coca-Cola 600 at Lowe's Motor Speedway, Earnhardt Jr. joined 26 other Chevrolet and Pontiac drivers in a mandatory General Motors test Wednesday at the 1.5-mile tri-oval. As usual, he was all laughs in pretest activities. But underneath the smile was a twinge of fear. "Before we went out for practice, I was (scared), but I wouldn't let anyone see that," said Earnhardt Jr. with a large grin on his face. "Sometimes I'm kinda scared or worried about what might happen and if it'll all be OK. But I try not to worry about anything until I get to it. If I didn't do that, I'd be in trouble. It's not healthy." Earnhardt Jr. is to be commended for his maturity at such a tender age. Growing up in the shadow of arguably the greatest driver ever - his father Dale - takes patience and gumption, as nearly every move is scrutinized. "Now, with him getting started in Winston Cup, everybody will be paying attention from the very start. Then you go and get a company like Budweiser as your sponsor saying we'll roll the dice on this kid. This is one of the biggest sponsorships ever with a young kid as the driving force. I know I was impressed. It really makes you step back and say, 'Wow.'" 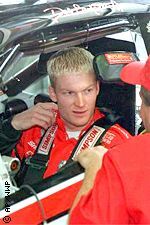 "Lil' E," as Earnhardt Jr. is affectionately known, has been wowing crowds since the 1998 NASCAR Busch Series Grand National Division season. Despite running a full slate of events for the first time in his young career, he drove home with the series title. After 10 races this season, he's right back on top. "We've had our ups and downs, but all in all we're leading the points, and you have to be happy with that," Earnhardt Jr. said. "I haven't won any races, though. We need to win races." Earnhardt Jr. got his first taste of NASCAR Winston Cup Series racing last season in Motegi, Japan, where he piloted the No. 8 Chevy for the first time. "That was really cool because I was worried about being competitive," he said. "We went over there and practiced really well, and we were really excited to get back to the track every day. I also got to race my Dad some, and I was really excited about that too." Along with the Coca-Cola 600, Earnhardt Jr. will also run NASCAR Winston Cup Series events at Loudon, N.H., Michigan, Richmond and the season finale at Atlanta. "Budweiser has given us every resource we could ever need to continue the success this team has had," Crisp said. "It gives you so much confidence. Now everyone's waiting for "E-Day" to see if (Budweiser's) hunch is right. "I think he's ready. You get him on the track and he's a killer. Off the track when he's with his buddies he's a lot of fun. I've gotten to see him develop as a person and as a driver. Being a successful driver has made him a wiser person and vice verse. The two go hand in hand." Either way, "Lil' E" won't get too caught up in the limelight that comes with high profile NASCAR Winston Cup Series competition. Why would he? He's been around it his entire life. "Junior was around (racing) at a time when he was cognizant of what was around him," Crisp said. "Watching what his father went through, he saw the demands on an individual in terms of time and attention. That's one reason why he's so well collected now. "He's also very intelligent and absorbs everything he sees and is very analytical. I wish I was as together at 24 as he is."